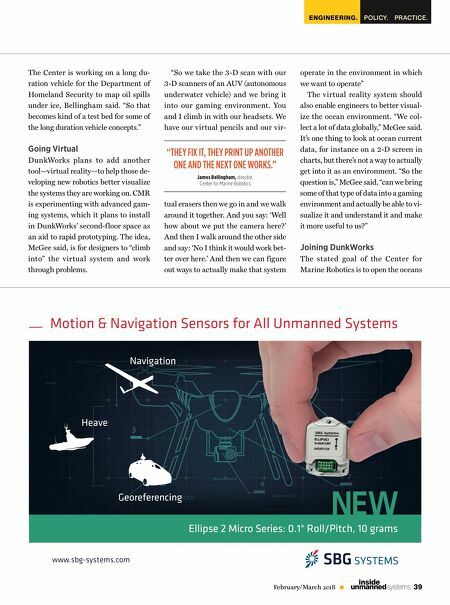 AIR PROTOTYPING 38 February/March 2018 unmanned systems inside said, where a gripper made with hard metal "could very easily crush and break the egg." Reimagining Design Bellingham a lso wants to advance the DunkWorks' design capabilities, expanding and, to a degree, automating the process of designing something new. First he wants en- gineers to be able to think more broadly about how they approach problems given new capa- bilities like 3-D printing and soft robotics. "So it's kind of interesting, right? You start out with something, which is kind of a maker space, and people can come in and use the ro- botics or the additive manufacturing systems, Bellingham said. "But then, as time goes on, you start getting the researchers thinking about how it really changes, for example, de- sign. How do you design things in fundamen- tally different ways? How do you approach QUARTET OF RESOURCES DunkWorks is one of four projects at the Woods Hole Oceanographic Institution (WHOI) benefitting from a $5 million dollar, five-year grant from the Collaborative Research and Development Matching Grant Program of the Massachusetts Technology Collaborative. The grant also supports infrastructure used for testing the marine vehicles and parts. WHOI is required to match the funds 3-to-1, meaning a total of some $20 million will be available for the four projects. Some of the grant money will go to upgrading WHOI's Advanced Pressure Test Facility. "As you know when you take things into the deep ocean you want to make sure they're not going to implode based on the pressure environments that you experience there," said Leslie-Ann McGee, assistant director at WHOI's Center for Marine Robotics, which houses DunkWorks. The Institution's In-Ocean Test Environment, an underwater area for testing located on the backside of Martha's Vineyard, will also get upgrades and core enhancements. The Martha's Vineyard Coastal Observatory is an in-water test area, McGee said. "It's an actual system out there that you can go out and maybe someday attach your (unmanned underwater vehicle) to and test the communications and things of that nature. Finally, WHOI will build an indoor Robotic Test Tank Facility that McGee said will be large enough to test unmanned systems. problems differently than you would have in the past?" But Bellingham wants to further evolve the total design process—capturing what has been done before in design modules that can then be plugged into the system, making it easier to engineer even the most advanced devices. 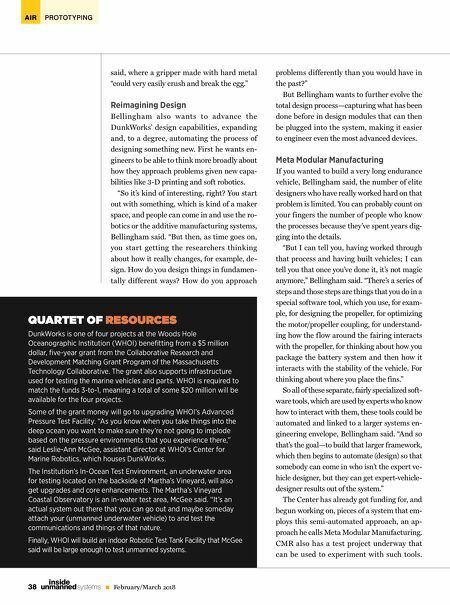 Meta Modular Manufacturing If you wanted to build a very long endurance vehicle, Bellingham said, the number of elite designers who have really worked hard on that problem is limited. You can probably count on your fingers the number of people who know the processes because they've spent years dig- ging into the details. "But I can tell you, having worked through that process and having built vehicles; I can tell you that once you've done it, it's not magic anymore," Bellingham said. "There's a series of steps and those steps are things that you do in a special software tool, which you use, for exam- ple, for designing the propeller, for optimizing the motor/propeller coupling, for understand- ing how the f low around the fairing interacts with the propeller, for thinking about how you package the battery system and then how it interacts with the stability of the vehicle. For thinking about where you place the fins." So all of these separate, fairly specialized soft- ware tools, which are used by experts who know how to interact with them, these tools could be automated and linked to a larger systems en- gineering envelope, Bellingham said. "And so that's the goal—to build that larger framework, which then begins to automate (design) so that somebody can come in who isn't the expert ve- hicle designer, but they can get expert-vehicle- designer results out of the system." The Center has already got funding for, and begun working on, pieces of a system that em- ploys this semi-automated approach, an ap- proach he calls Meta Modular Manufacturing. CMR also has a test project underway that can be used to experiment with such tools.